When a new baby makes its appearance in a family, it can be a challenge for both mum and dad to connect with the new baby. Lack of sleep and the other demands of being a new parent can wear thin on both fathers and mothers. But mum tends to have a better opportunity to get close to the new baby simply because she usually spends more time at it. And yet dads often feel a significant need to get close to the new baby, but have a challenge getting there. So we asked some new dads and some of the experts about how best to help dads bond with their babies. Don't try to compete with mum. Your baby's mum has some natural, built in advantages in the bonding process. If she is breastfeeding, she gets lots of quality touch and eye-contact time with the baby. She also has the benefit of post-partum hormones that give her natural bonding feelings. So don't try to compete with nature. You will not bond as quickly as she will. But you need to take steps to make quality bonding time with baby. Keep in touch. Babies have pretty limited communication skills as an infant. But one meaningful way babies can communicate is through touch. Babies love being skin to skin, so take off your shirt and put the baby on your chest. Massage her gently; caress her arms, legs, hands and feet. Repeated loving touch will help baby connect with you better and faster. See eye to eye. One of the things a breastfeeding mum learns is that holding a baby at her breast puts the baby at the perfect location for baby's vision. Cradle baby in your arms at about chest level, and you'll be at the right spot for connecting visually. Eye contact helps you build a bond with your little one. Connect with music. Babies love music, and they find a soothing spirit when dad sings and dances with them. Put some fun music on the sound system and hold baby while you dance. Lullabies can be a real bonding experience also as you sing baby to sleep. Just jump in. 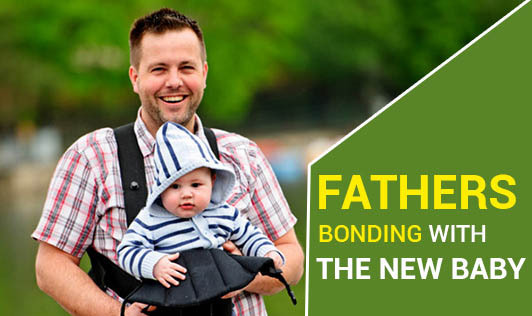 Lots of new dads are a little nervous to get involved in this bonding process. They feel uncertain about what to do and when to do it. New dads who have been there recommend that you just start. Pick up the baby and start following some of these ideas. Check in with the doc. Dads may be tempted to skip those "well baby" visits to the pediatrician. Take the time off work to go with mum and baby to the doctor. This is a good time to learn more about your baby and how he is doing. More information will help you feel closer to the baby. Become part of the routine. Often, mum tends to be the primary caregiver for your baby. But many things that are part of mum's and baby's routine can be taken care of by an interested dad. Consider giving your baby a bath, taking him on a walk, or feeding him from time to time. You'll give that tired mother a break, and create some new bonding time with the baby. Be patient through the process. The very nature of the bonding process between baby and father is different and tends to take longer than the process of bonding between baby and mum. Don't get discouraged as the process develops; the feelings of bonding are worth the wait, and will pay big dividends later. Being a committed dad involves an investment of time, and that applies at all stages of your child's life. When she is an infant, the time investment is in holding, cuddling, singing, and bonding. If you invest the time in this bonding during her infancy, you will maintain and enhance that feeling of closeness as she grows and matures. It is an important investment to make, now and in the future.